ASK TOM: ARCHITECT ADVISES ON KITCHEN PAINT! I thought I would try out a new segment here on COCOCOZY. It is inspired by all of the emails one architect has received from being featured here on COCOCOZY. The architect’s name is Tom Newman of Newman & Wolen here in Los Angeles. Almost two years ago, I did my first post on Tom’s work and since then and several fab posts later, Tom has received dozens and dozens of emails from COCOCOZY readers asking design and architecture questions. Tom suggested that I post some of the emails between him and my readers…I thought, “that’s a good idea”. So, this is a trial run of this new COCOCOZY franchise called ASK TOM. I recently saw beautiful pictures of a project you worked on in Cheviot Hills in LA. It was a Spanish villa of sorts. 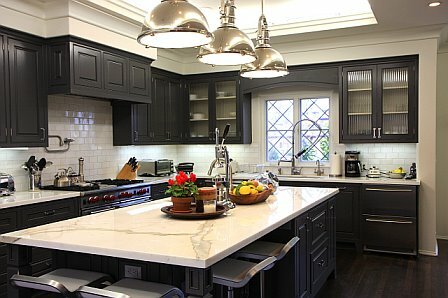 I loved the kitchen and I know you chose Benjamin Moore Iron Mountain for the cabinetry but wondered what paint color you chose for the walls. The color combination is stunning. I found out it was the old standard, “Swiss Coffee”, probably from Benj. Moore or Dunn Edwards. This color is a good neutral because it is not sharp like pure white, not too yellow, and goes with almost everything. ***Thank you very much Tom. Living in Canada my challenge will now be how to track it down. I’ve never heard of Dunn Edwards. I think I will need your luck! ***Most paint companies have a version of Swiss Coffee. Can you get Benjamin Moore paint? If so, you’re fine. ***Yes we can definitely get Benj. Moore. If I have to, I’ll use their equivalent. I’m sure it will be very close. I hope you don’t mind answering one more question for me. What paint finish do you recommend for kitchen cabinets – semi gloss? Yes. Semi-gloss, so it can be wiped clean. The wall would probably be “eggshell” for the same reason. “Flat” stains and can’t really be cleaned without taking off paint. ***I am so sorry but I have one final question – I promise. My spray painter “guy” just told me I needed to provide him with melamine paint for the cupboards. Do you recommend melamine paint or just regular semi-gloss paint? I’m not quite sure what that means. As far as my familiarity with these terms, melamine is a veneer put over wood or MDF (fiber board), sort of like Formica. If you are repainting old cabinets that have a melamine veneer, then you need a special paint that will adhere to it. This is a new product (within the last year or so) that did not used to exist; it used to be that you just could not paint melamine. I’ve never worked with the new paint, but I’m told it works. As for the sheen of that special paint, you can probably get it in a semi-gloss or the equivalent. When you are done with your project, be sure to send photos to Coco for her to post on the blog. Everyone loves before and after shots. 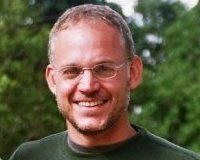 If you have a question you’d like to ask architect Tom Newman of Newman & Wolen, please email him at [email protected] and maybe your correspondence will be chosen for the next ASK TOM! Thank you Tom and Sandra for sharing your email chain with me!